Berlin, August 5, 2015 – The Document Foundation announces LibreOffice 5.0, the tenth major release since the launch of the project and the first of the third development cycle. LibreOffice is a full feature open source office suite which compares head to head with every product in the same category, while it stands out for superior interoperability features. LibreOffice 5.0 builds on the success of the 4.x family, which has been deployed by over 80 million users (source: TDF estimate, based on users pinging for updates), including large organizations in Europe and South America. LibreOffice 5.0 sports a significantly improved user interface, with a better management of the screen space and a cleaner look. In addition, it offers better interoperability with office suites such as Microsoft Office and Apple iWork, thanks to new and improved filters to handle non standard formats. Other improvements have been added to every module of the suite, and Windows 64bit builds (Vista and later) have been added. A new version for new endeavours: LibreOffice 5.0 is the cornerstone of the mobile clients on Android and Ubuntu Touch, as well as the upcoming cloud version. As such, LibreOffice 5.0 serves as the foundation of current developments and is a great platform to extend, innovate and collaborate! A beautiful office suite designed by a fantastic community: With new icons and major improvements to menus and sidebar, LibreOffice looks nicer and helps users in being creative and getting things done the right way. In addition, style management is now more intuitive thanks to the visual preview of styles right in the interface. Spreadsheets that rock: LibreOffice 5.0 ships with an impressive number of new and enhanced spreadsheet features: complex formulae, new functions, conditional formatting, image cropping, table addressing and much more. Calc’s blend of performance and features makes it an enterprise-ready, heavy duty spreadsheet capable of handling all kinds of workload for an impressive range of use cases. Better filters for better documents: LibreOffice 5 ships with many improvements to document import and export filters, for an enhanced document conversion fidelity all around. In addition, it is now possible to timestamp PDF files generated with LibreOffice. A complete list of the most significant new features is available on the accompanying press release, and has also been published on the website at the following link: http://www.libreoffice.org/discover/new-features/. LibreOffice 5.0 has also been improved “under the hood,” thanks to the precious work of hundreds of volunteers. According to Coverity Scan, the number of defects for 1,000 lines of code is now consistently below 0,001. This translates into an open source office suite which is not only easier to develop but it’s also easier to maintain and debug. In fact, the amount of solved bugs is now over 25,000, and is increasing rapidly. Last, but not least, LibreOffice 5.0 has been improved in terms of quality and stability thanks to a large number of tests performed on new builds by going through thousands of documents to spot crashers, bugs and regressions. A summary of what has happened “under the hood” of LibreOffice 5.0 is available here: http://users.freedesktop.org/~michael/under-the-hood-5-0.html. LibreOffice 5.0 represents the bleeding edge in term of features for open source office suites, and as such is targeted to technology enthusiasts, early adopters and power users. For enterprise class deployments in organizations of any size, TDF maintains the more mature 4.4.x branch (now at 4.4.5). In any case, TDF suggests to deploy or migrate to LibreOffice only if the project is backed by certified professionals providing Level 3 support, migration consultancy or training courses according to recognized best practices (http://www.libreoffice.org/get-help/professional-support/). 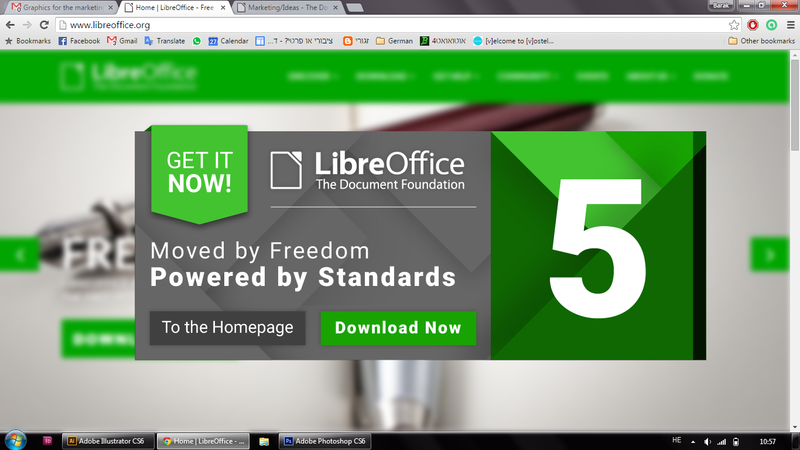 LibreOffice 5.0 is immediately available from the following link: http://www.libreoffice.org/download/. LibreOffice users, free software advocates and all community members can support The Document Foundation with a donation at http://donate.libreoffice.org.